How to make Southern Fried Chicken. A very simple method I learned from my grandmother. Frying chicken to some people is an art and they firmly believe in the way they do it and there is no other way. I am not that rigid about my simple little recipe as I know there are so many different ways of doing things in the world of cooking. My grandmother told me that she learned how to fry chicken from her mother. She was one that felt like there was no other way than her way. I will have to say that she fried some pretty good chicken back in the day. I will share with you a method that she taught me that is very simple and will get you on your way to frying chicken. Over time you should experiment with different spices and different methods to one day develop your own way of frying chicken. There are so many different ways to fry chicken. Everyone seems to have their own special method and recipe. I grew up in Southern Virginia and my grandmother taught me how to fry chicken by the time I was 10 years old. To her it was a requirement that all little girls should know how to fry chicken. She would tell me that once I set up housekeeping that I better know how to fry chicken for my family. So I would get out my little step stool and stand beside her in the kitchen and watch her fry chicken. She would eventually let me start participating and would critique every move I made until I got it right according to her standards. She was a true southern cook and there was always some type of fat included in her recipes. I just made my grandmother's Southern Fried Chicken the other night for dinner and thought I would share her simple recipe. For this article I had to determine exactly how much of each of these items I would normally put into a recipe. Southern cooks like my grandmother would always say to just add a pinch of this and a pinch of that. I also do the same when I cook. I add spices a pinch at a time until I it tastes the way I like it. If any of these items are not enough, add some more. The cayenne pepper and paprika is optional. Sometimes I add it and sometimes I don't. My children don't really like the cayenne because it adds a kick to the chicken. They prefer just salt and pepper. I have always used Crisco shortening or have also used vegetable oil. I am not sure how other oils will work since I have not tried them. I think as long as you can get the oil to about 350deg F then it will be fine. Over time you will experiment with different spices and ingredients and come up with your own recipe that you will pass down to your children and grandchildren. 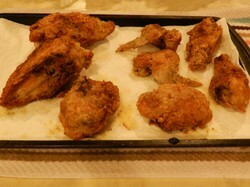 Cut up the whole fryer chicken into 2 breasts, 2 thighs, 2 legs, and 2 wings. Discard the rest of the chicken. Wash chicken pieces and place in a large pan in a single layer. Sprinkle spices over the chicken. This will include salt, pepper, and garlic powder. Also add cayenne and paprika if using them. Put enough shortening or oil in the skillet so that it is approximately 1/3 full once all melted. Heat oil to 350 deg F. This is the recommended temperature. I have always heated the oil until it just started popping in the middle. I would then take a pinch of flour and throw it in there to see if it immediately started cooking. Another one of those southern things I guess. Set up your dredging station with the eggs in one bowl, flour in a bag and an empty plate to sit the chicken on after dredging. I sprinkle flour on the empty plate to help keep the flour on the chicken before it goes into the skillet. A paper bag works best for the flour but a ziploc or freezer bag will do just as well. My grandmother always used a paper bag for her chicken. This is where I am sure there will be some disagreements. I was always taught to dredge the chicken through the egg wash and then put in the flour. I have had many people tell me that it is better to dredge through the flour first then dip in the egg wash. You can do it either way and it turns out great with both methods from my experience. I like to do the egg wash first as I feel like the flour sticks better and my crust is crunchier. Run the chicken one piece at a time through the egg wash and then put into the bag of flour. Close the top of the bag and shake it like crazy until the piece of chicken is coated with flour. Place the coated piece of chicken on the flour coated plate. Repeat until all the chicken pieces are coated. Optional – sprinkle the top of the chicken with additional black pepper, cayenne pepper, and paprika before placing in the hot oil. Carefully place the chicken into the hot oil, skin side down, one piece at a time until the skillet is full. I can always fit all the pieces into the skillet. I start with the breasts, then the thighs, legs, and wings last. Fry for approximately 15-20 minutes per side. I can tell when the chicken is done by looking at the crust. I would suggest placing a thermometer in the chicken after 40 minutes of frying and make sure the internal temperature is around 180 degrees. Take out each piece as it gets done and place on a flat surface covered in paper towels to drain. I use a cookie sheet covered in paper towels. You are now ready to eat your Southern Fried Chicken. Our family favorite is mashed potatoes and fresh green beans with our Southern Fried Chicken. Don't forget a tall glass of sweat ice tea! In my opinion the two most important things that will help you accomplish perfect fried chicken is to make sure the oil is hot enough and the chicken is drained properly after cooking. You can always take the piece of chicken directly out of the bag and place directly into the hot skillet. Just make sure the oil has heated to the proper temperature before doing so. Your chicken will not turn out crunchy or good at all if the oil is not hot. I turn my skillet on while I am dredging and placing the chicken on the plate gives the oil time to get up to the proper temperature. Hey Angel, I just wanted to share a little cooking tip with all your readers. As far as using butterrmilk. We can always put a table spoon of Apple cider vinegar in a cup of whole or skim milk as a substitute. @janices7 - thank you for stopping in and commenting. I just love fried chicken. I am glad you liked it. Yeah. . its not that healthy but sure is good. @kinworm - I really like good fried chicken. It is so good. the photos could have been a little better. I am just learning how to work my new camera. thanks for stopping in and commenting. Angel, this looks delicious :) I love your photos which take you step by step though what you need to do to make yummy southern fried chicken. @teddletonmr - It is so great to have your kids help cook. Those are some of my greatest memories as a child. My grandmother would let me help her make biscuits and I would get flour all over me and the kitchen. LOL. Everyone always seems to be in a such a hurry these days... slowing down and involving the kids really makes for great memories at the end of the day. I do understand how demanding having four kids around the house can be. My wife and I have two boys that try their best to eat us out of house and home. Fried chicken is one of their favorite foods. Our two girls, enjoy helping in the kitchen, much the same as you helping your grandmother when you were just a little lady. @teddletonmr - Yes.. I have seen and heard about buttermilk. Some people soak their chicken all night in buttermilk too. There are so many ways to fix this great dish. I too need to experiment a little. With four kids I do well to get anything cooked without burning it! Thanks so much for reading and commenting. Fried chicken, mashed potatoes sweet tea and cornbread. Are my favorite southern foods. Thanks for sharing your grandmaw's fried chicken recipe. What about using buttermilk in the egg wash? Cooking your own tongue is the natural way to obtain the best results. Cooking a tongue owned by someone else will give just as good results.